Kenya has been in the press for all the wrong reasons recently – but there’s much more to this vast country than the headlines suggest. Southern Africa specialist Anna Devereux Baker recently headed out to Kenya to find out for herself, and discovered a warm and welcoming country holding its own despite recent setbacks. I’d actually worked it out, sitting on my British Airways flight bound for Nairobi. To date I have visited Africa no less than 37 times (this current trip being my 38th). But this was my first ever trip to Kenya. How had I missed such a trick? I’ve always been a Southern Africa explorer – happy to walk in the wild bush of Zambia, mokoro the deep water channels of the Okavango Delta in Botswana and scramble up the bright orange dunes of Namibia. 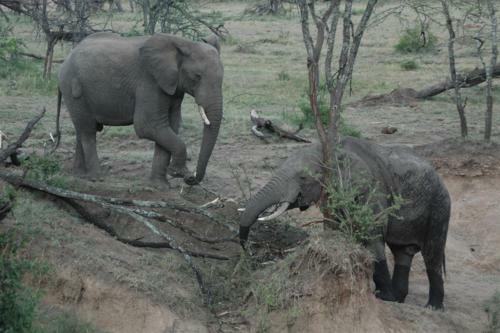 Kenya was a completely unknown quantity to me, and one I was excited to explore. 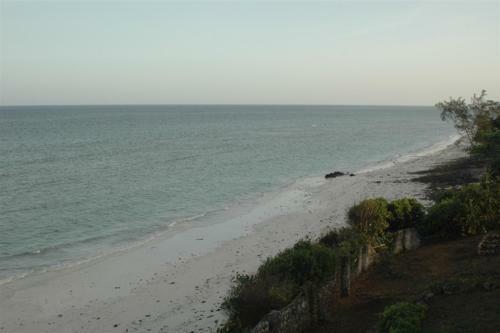 My trip started in the beaches south of Mombasa – Tiwi and Diani beach. Here the pace of life is slow and meandering, and the air is steamy and rich with the scent of the frangipani trees which seem to be on every corner. The beaches are the brightest white and almost pristine, a dot of seaweed here and there, but with mercifully few beach boys. 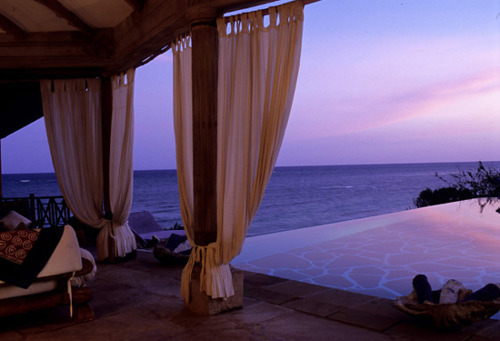 My first stop was at Alfajiri Garden Villa, exceeded all my expectations. Individually designed private rooms, cooled to glacial levels by the welcome air-conditioning and some of the best food I have ever tasted – surf-fresh fish and a rainbow array of fruits fresh from the bough. I spent the evening watching the sparkles of light from the fishermen’s boats as they headed out for a night’s foraging on the open seas. From the beach I headed to the bush – first stop Lewa Wilderness Trails. Here we set out on four legs – riding in amongst Lewa’s wildlife, which watched us with a detached air and allowed us to come close. Giraffes peered from their lofty position above the branches, and a solitary bull eland approached, knees clicking, to examine us. The ride ended with a sunset trot back to the lodge, the horses knowing that their supper was waiting. The lodge also offers wonderful walking safaris – aptly named Walking Wild – accompanied by camels and brightly dressed Maasai guides. 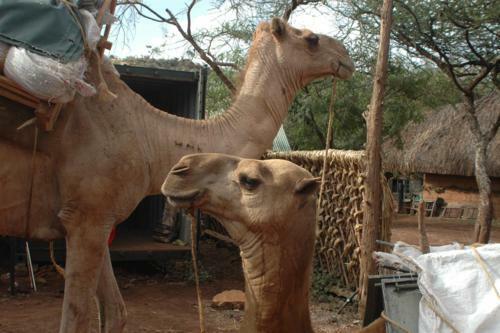 The camels – shaggy, lanky things – were left free to graze after being relieved of their loads. The camp is very simple – dome tents are set in a grove of shady trees and your suppers are served under the stars. 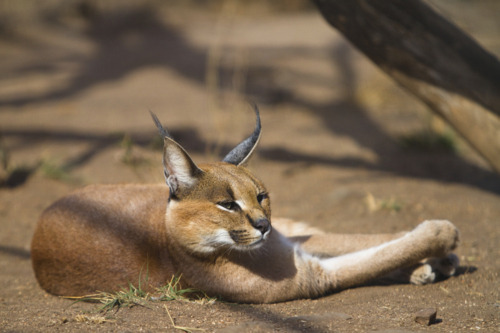 Our next stop, Laikipia, gave us one of the rarest sightings I have ever had – a pair of mating caracals. This small, tan colored feline has long, elegant tufts of black hair on its ears, and beautiful, grey-green, sooty eyes. When we spotted this pair they froze in position, almost comically, before disentangling themselves and melting away into the bush without a backward glance. 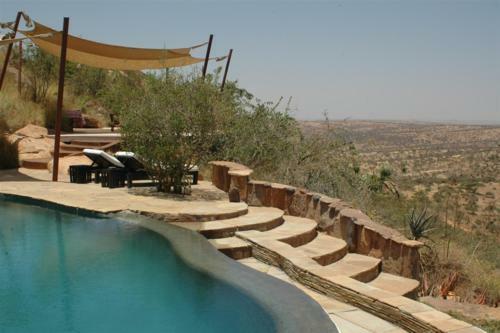 Laikipia is majestic in every way – swathes of hills rolling away to the horizon and views to die for. We visited the Sanctuary at Ol Lentille – perched on the top of a hill with 360 degree views and an infinity pool complete with “pods” in which to relax. Moving onwards to the Mara, our first stop was at Ol Seki, quite the most sublime camp overlooking a permanent waterhole teeming with game. Chunky-bottomed zebras, shimmering in the heat-haze, fought each other for command of their females as we watched. 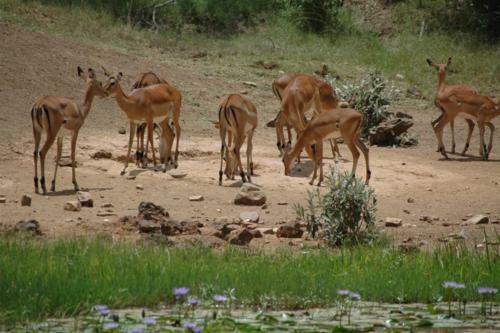 Delicate impalas lowered their heads to drink before skittering away as one, spooked by a bateleur eagle’s shadow passing overhead. After darkness fell we listened as two prides of lion exchanged insults across the valley, punctuated by the high excited squeals of hyena. At our next stop, Mara Plains, we battened down the hatches in our tents as an almighty storm blew up, the curtains in my tent almost horizontal. 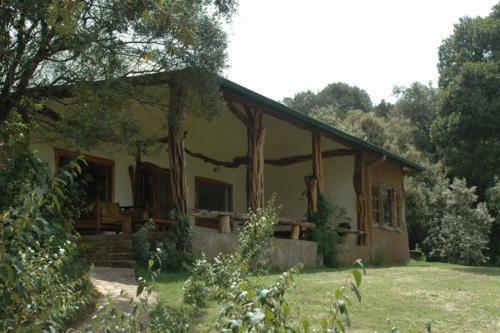 Our final stop was Acacia House, on the far side of the Mara. We drove across parched plains, the grass becoming greener as we got higher and higher. An almost impossible mountain confronted us; how on earth would we get up that, even in our trusty land cruiser? Our guide grinned and started to weave his way up through the bushes dotting the slopes. Every now and then an enticing view would present itself; emerald green plains spreading in all directions. Finally we reached the summit, the cruiser groaning – and the view was nothing short of spectacular. The Mara, even at this, the driest time of year, was green and plentiful, dotted with the tiny black figures of wildebeest. Following the alarm calls of puku, shrill little whistles, we noticed a movement in the grass. A head appeared, and then a second head. 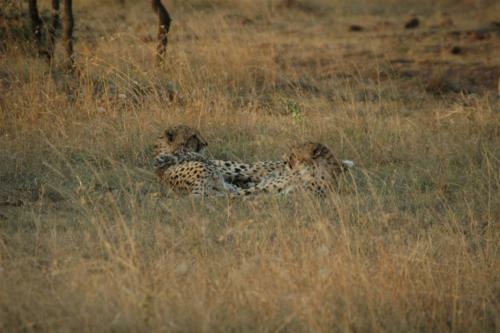 Bright green eyes with the characteristic “tear stains” on the cheeks told us we were in the presence of two cheetahs. Supremely relaxed, they lolled in the grass, paying us very little attention before getting up, stretching languorously and trotting away into the bush. We arrived at Acacia House to be welcomed by fresh fruit juice and a glorious little lagoon fringed with reeds and water lilies. Exquisite butterflies darted here and there and warthog came down to drink, fixing us with a beady eye before deciding we were nothing to fear. As our last night in Kenya, supper that evening was a lively affair, shared with our Maasai guides who regaled us with tales of their childhood, of growing up in the bush. Leaving the Mara the following morning by light aircraft, we flew over the almost endless plains and onwards towards Nairobi. 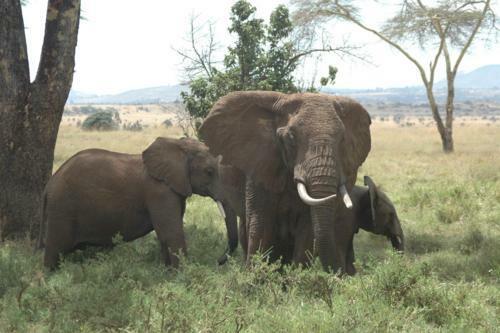 Kenya is a very special country – a land of extreme contrasts from the white sand beaches to the vast open plains. 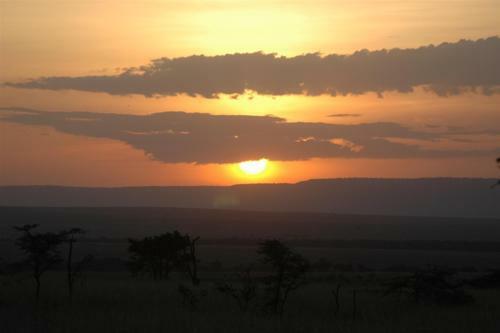 Come here for spectacular game-viewing, friendly people and some of the best views on the continent. Inspired by Anna’s Kenya trip? Contact our Africa specialists on 020 8682 5070.